A popular Nepali singer, also, an initiator of Nepali Sufi music, Hemanta Rana, despite his lack of musical lessons, has been able to win the heart of many music lovers. Describing himself as nothing more than a bathroom singer, he never, in his life, imagined that he would end up being a popular singer of Nepal. Now that he has chosen this field as his career and also he has expectations of his fans to fulfill, he will be taking music seriously and for that taking music classes is the first priority. Although he feels that the music industry is not as supportive to the new artists as it should be, he hopes that there are possibilities that his kind of music will be appreciated. One who never imagined he would take up music as his career, his entry into the field seems like a fairytale. One day, he had an opportunity of singing at a restaurant named ‘Yak Palace’. While he was singing, the chairman of SAV, Raman Singh Shrestha heard him and asked him to come to the office to discuss few things. When he went there, they signed a five year contract stating that SAV would produce and promote his albums. It grabbed the opportunity but unfortunately, the chairman went to United States and his album could not come out on time. It was difficult for him to get dates at the recording studios and also the behaviors of the musicians were not very cooperative. He had to face many challenges while doing the album but he is glad that the album did release at last. However, he is not satisfied with his first album ‘Paap Punya’ (sin, virtue) as he thinks that the music is immature and the album lacks many things. 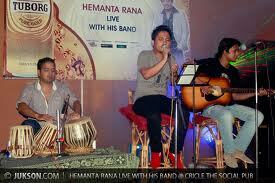 He has also done a cover version of a Hindi Sufi song by Kailash Kher which is really impressive. Also a Wushu Player, he has won a gold medal at the National Wushu competition. He is involved in many stage and live performances and being the initiator of Sufi music in Nepal, he definitely is an excellent Sufi singer Nepal has.